Let’s talk about carbohydrates. 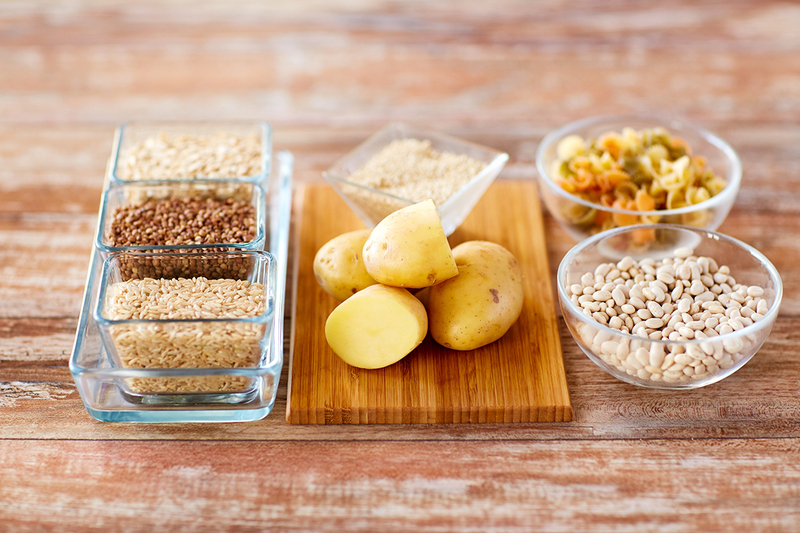 In the fitness world, there are many misconceptions about certain foods, especially carbohydrates. Some say you should have them and cut down on fats, some say you shouldn’t have them at all and only consume protein and fats, some say carbs have no calories etc. In this article, I will talk to you about these statements and give you my knowledge and research behind it. Then, you can make your own decision. So, what do carbs do? Are they good or are they bad? First of all, they are one of three macronutrients, alongside protein and fats. Carbs are the main source of energy for our body. Carbs are stored as glycogen in the body and then converted into glucose when we need it. Refined carbs are foods such as sweets, cakes, biscuits and most things containing a lot of sugar – white bread, white pasta and also pastries. These are dangerous as they have a high GI and can be used as a quick release of energy. BUT, they do not contain many nutrients and can be seen as unrefined. These are the wholemeal products that contain fibre which can give a feeling of fullness and help regulate blood sugar levels. They have a lower GI and have less sugar compared to refined carbs. Some examples are wholemeal bread, whole grain rice, fresh or frozen vegetables, sweet potato and quinoa. Last month’s article spoke about RDA (Recommended Daily Allowance) and BMR (Basal Metabolic Rate). The body needs carbohydrates to function properly. Without them, we will function more slowly, we will feel tired and lethargic. We will have less energy and we will be depleted. Our brain needs carbs so without them, our decision making is affected and so is our memory to recall information. Remember, vegetables are carbs. Without them we can be low in energy, become ill and notice deterioration in our hair, skin and nails as we are missing vitamins and minerals. Some people try a low carb diet where they will reduce the amount of carbohydrates they have each day – for example they may drop down to less than 50g a day. If you track this, you will find that it is very challenging. Serotonin is the feel-good chemical in our brain, that promotes a feeling of happiness and satisfaction. Some studies show there is a link between low carb diets, not exercising and depression. Q. Should I eat carbs but cut down on fats? A. That would be a good start. Fats contain more kcal per gram so be wary of that when measuring your daily calorie intake. Q. Should I cut out carbs completely and only have proteins and fats? A. From above, that would be unsustainable. You wouldn’t be able to function very well and should maybe choose better carb options with Lower GI which will make you feel fuller for longer. Q. Do carbs have no calories? A. Unless you’re eating thin air, which is referred to as breathing then eating foods contain calories. You have the power to choose what foods you eat. To achieve any goal you set in life or fitness, you need discipline and commitment. Results take time. If you have started to reduce carbs in your diet but your weight isn’t changing much on the weighing scales, that’s ok. Trust the process as these things take time. It is also worth noting, that you may be losing body fat, which a normal weighing scale doesn’t show you. If you drop body fat and increase muscle mass, your weight will not change much on the scales. Remember, to live a healthy lifestyle, it’s all about balance. Therefore, getting the balance between eating the right amount of carbohydrates, proteins and fats is key. By all means, cut back and cut down but in moderation. Drastic changes and cut backs will only be a short-term fix and can have a big effect on the body, causing cravings. It’s the sustainable measures that bring better results for you and for your health. Visit my Instagram page @nicky__fitness and my website www.nicky-fitness.com for more information.